Plus & Minuses of Home Renovations – Accurate (Peel) Appraisals Inc. There is little question that the G.T.A Real-Estate market remains influx! 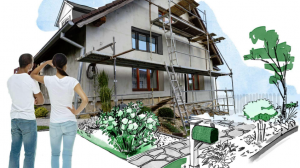 Perhaps renovating your existing home my be a viable alternative? Remembering those old adages about location & your home having good bones, is an excellent starting point. Check out the Globe & Mail article below about the intrinsic follies & benefits of completing a home renovation. Please recall that the best place to start with any renovation is by having a professional appraisal completed on your home! Natalie Alvarez and Rajiv Kaushik talk to their contractor Todd Crockford in their newly renovated kitchen inside their Dundas West area home. The couple, both university professors, with two young children, were looking to move to a larger home. After factoring the costs of the move including extra mortgage payments fees and taxes, they decided to renovate. They turned a muck room at the back into larger kitchen and added a third floor. When their second child was born two years ago, Rajiv Kaushik, 39, and Natalie Alvarez, 43, began scouring the market for a larger home. The family’s two-bedroom, semi-detached Victorian in central Toronto had soared in value since Mr. Kaushik bought it in 2007 for $540,000. But as the couple quickly realized, so had every other property in the Greater Toronto Area. Initially they had expected to sell their home for $850,000 and buy a bigger house for $1.2-million. But prices have continued to skyrocket in the GTA, jumping an average of 23 per cent in the past year alone. Now, the couple’s home is worth closer to $1-million. But the prices of the properties they were looking to buy have risen to closer to $1.6-million. Buying a larger home would likely mean taking on an additional $600,000 in mortgage debt. Mr. Kaushik estimates that land-transfer taxes, realtor fees and other costs of selling a property would add another $100,000. Earlier this year, the couple opted to renovate their current home instead. The extensive upgrades included adding an extra 700-square-foot finished attic with a master bedroom, bathroom and space for home offices for the couple, who are both professors at Brock University. Toronto may be Canada’s hottest seller’s market at the moment, but for Mr. Kaushik and Ms. Alvarez – and many homeowners like them – the prospect of selling and becoming buyers amid frenzied bidding wars and surging prices is enough to convince them not to move. The result is that many homeowners are opting to stay put rather than test the market, pushing the inventory of resale properties in the GTA market in 2016 to its lowest level since 2007. That has created a vicious circle, leading to fewer homes on the market and more competition for the few available listings. The average GTA property sold in just 17 days in 2016, the shortest selling time since the Toronto Real Estate Board began publishing statistics in 1996. One of the reasons many homeowners are hesitant to jump back into the market is that the intense competition has widened the gap between the price of the starter homes that many young families bought several years ago and the move-up properties they hope to buy today. The gulf between the average price of a detached house and a townhouse in the GTA hit nearly $460,000 in November, up from $278,000 in November, 2013, – a 65-per-cent jump in just three years, according to TREB data. That widening chasm in home prices has “paralyzed” the move-up housing market, says Canadian Imperial Bank of Commerce deputy chief economist Benjamin Tal. “We’re seeing an asymmetrical increase in prices, where more expensive properties have risen faster than less expensive properties, which means that if you want to move up, you can’t,” he said. He believes the demand for GTA’s high-end housing market is being driven mainly by speculators, both foreign and domestic, rather than move-up buyers. Jason Kendal, 31, and wife Mariam, 29, were preparing to sell their townhouse in Vaughan, north of Toronto, and rent in hopes they buy back in when the market corrected. It was their real estate agent who talked them out of the idea. “I’m a realtor who sells houses for a living and I said to them: ‘Guys if I were you I would not sell your house right now,'” says the Kendal’s realtor, Shawn Zigelstein of Royal LePage. He convinced the couple they were better off staying put since if home values continue to rise, they would lose out on the extra home equity if they were renting. The trend of staying put has also helped fuel a surge in home-renovation spending that has eclipsed the value of new-home construction in recent years. The Canadian Home Builders Association estimates that renovations contributed $70-billion to total national housing investment in 2015, compared to $58.7-billion for new home construction. With a four-year-old son and a baby due in May, Gavin and Vashtie Singh had been looking to upsize from their 1,800-square-foot semi-detached home in Vaughan, a suburb north of Toronto. But with prices of detached homes in the neighbourhood rising out of reach, the couple, both in their 30s, are now planning to finish their basement to add space and buy their home another 5-to-7 years. “Once you do all the calculations with property taxes and heating bills and then the mortgage increase and you have young kids, it becomes ‘let’s just renovate,'” says Mr. Singh, who bought his home in 2009 for $368,000. Rather than sell and rent, the Kendals have also opted to stay put and renovate. They borrowed $15,000 from family to build a playroom in the basement for their 9-month-old son and have budgeted another $20,000-to-$25,000 for additional renovations, which they plan to finance through a line of credit. They still hope to buy a larger home, but figure the renovations have bought them some time.